Telling Your Small Business Brand Story (17:37), with branding experts Emily Soccorsy & Justin Foster. Emily and Justin are the co-founders of the branding practice Root + River. They share their entrepreneurial journeys and then we chat about (starting at 17:37) how you can develop a brand story for your small business that’s in alignment with your core beliefs. They introduce the “5 Core Beliefs or Root Beliefs” approach to small business branding. Emily specializes in collaborating with leaders and teams to build brands rich with meaning and connection. She helps her clients uncover real, relevant brands with leaders who believe branding is first a spiritual experience. She also coaches leaders on the articulation and creation of their brand. Emily studied English, communications, and writing in school, and enjoyed a successfully career before launching her first company. Justin believes that nothing matters until you connect to your heart. Along a journey that started on a cattle ranch in eastern Oregon to 50 states and 6 countries, he has worked with leaders of every sector and industry to discover their truth and convert it into vibrant, relevant brands. 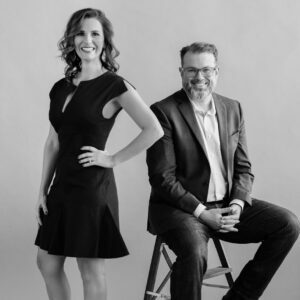 Emily and Justin are the co-founders of the branding practice Root + River. Emily lives in Scottsdale, Arizona, and Justin lives in Austin, Texas.